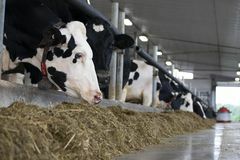 Canada’s milk producers say Canada has surrendered its ability to independently manage its dairy system with the signing of the updated North American free-trade agreement on Friday. The farmers say the final text of the trilateral agreement, announced on Sept. 30 and signed by leaders of the three countries at the G20 summit in Buenos Aires, grants the trading partners a say in the running of Canada’s dairy system, eroding Canadian sovereignty while giving up new market access. The United States-Mexico-Canada Agreement (USMCA) opens 3.6 per cent of Canada’s dairy market to tariff-free imports and limits Canada’s global dairy exports of skim-milk powder, baby formula and milk-protein concentrates. Additionally, the United States will have the right to be consulted or participate in the process on changes to Canada’s dairy classification system, wording that the dairy farmers say they were assured by Ottawa would not be in the final text. Foreign Affairs Minister Chrystia Freeland told reporters in the Argentine capital on Friday that the “modest increase” in U.S. dairy access was granted to help reach an agreement that provides the country with the “stability and predictability” of a deal that protects $2-billion a day in cross-border trade. For the auto sector, USMCA increases the regional content of tariff-free vehicles and requires that 40 per cent of a car be made by workers earning at least US$16 an hour, a shift that favours U.S. and Canadian assembly plants over low-wage Mexican assembly lines. The final text of the deal also clarifies how car exports from Canada and Mexico will be protected if President Donald Trump follows through on threats to impose 25-per-cent tariffs on autos brought into the United States. Under updated side letters released Friday, Canada and Mexico will have the power to “monitor and otherwise administer” how many cars produced by specific companies are protected from tariffs, but will have to “consult” with the United States on this. The letters also say Canada and Mexico have to consider whether an automaker is complying with USMCA’s auto-content rules − which mandate that vehicle makers source more car parts from North America – when determining how much of that company’s production to protect. As The Globe and Mail reported previously, the United States has been pressing Mexico behind the scenes to allow the Trump administration to decide how much production from each company would be protected in the event of future tariffs. Having such power would allow the White House to punish automakers it is angry with by leaving some of their production unprotected from tariffs. USMCA also leaves unresolved the U.S. tariffs on steel and aluminium from Canada and Mexico. In talks over the past few months, the United States has demanded that the countries accept quotas on exports of the metals in exchange for the lifting of tariffs. One Canadian official told The Globe that Ottawa would only agree to a steel quota far higher than current exports, and would not agree to any quota at all on aluminium. The United States, for its part, wants Canada and Mexico to accept quotas that would force them to export less of the metals to the United States, said sources briefed on the negotiations. USMCA must now be ratified by the U.S. Congress before taking effect – and legislators on both sides of the aisle have already signalled they could give the deal a rough ride. Democratic Senator Elizabeth Warren said she would vote against the pact unless it is reopened to toughen labour and environmental standards, and does more to stop U.S. companies from moving to Mexico.